The South Nahanni is a big river with powerful currents, boils and challenging whitewater. The South Nahanni River is navigable from June to September. 3) extensive experience travelling and camping in a remote, wilderness environment. If you do not meet all three criteria, we strongly recommend that you travel with a park-licensed outfitting/guiding company or obtain the necessary skills and experience before visiting. 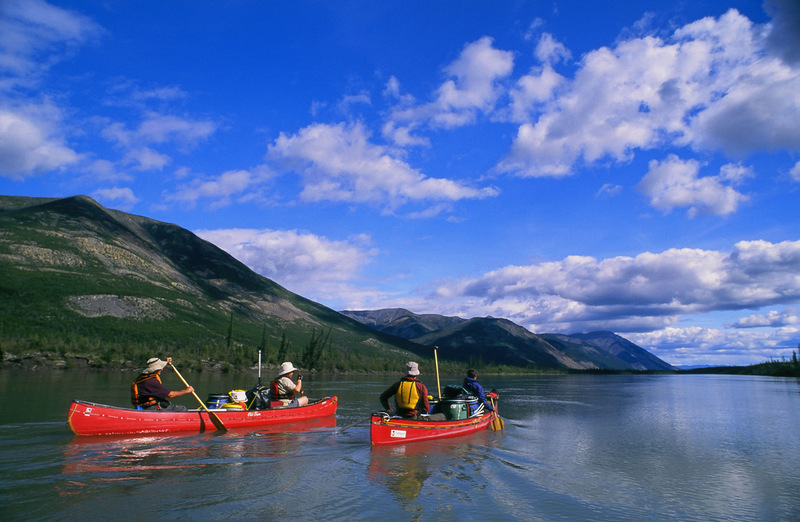 Reservations are required for river trips in Nahanni. It is recommended that they be made well in advance due to popular demand. Registration through the park office is required prior to entering the park for a river trip. De-registration is mandatory upon your safe return. People typically begin their river trips at one of the two designated landing areas within the park – Virginia Falls or Rabbitkettle Lake. A river trip from Virginia Falls will take 7-10 days, while a river trip from Rabbitkettle Lake will take 10-14 days. From Rabbitkettle Lake to Virginia Falls, a distance of 118 km, the river meanders through a broad valley. There are no rapids on this section which has a mean gradient of 0.7 m/km. At Virginia Falls, the river plunges into the first of four great canyons. The 147 km section from Virginia Falls to Kraus Hot Springs has a number of rapids up to Class III in difficulty. The mean gradient is 1.7 m/km. Splash covers are necessary for this section, particularly in Canyon Rapids, Figure 8 Rapids and George’s Riffle. Downstream from Kraus Hot Springs the gradient decreases to 1.1 m/km and the river branches into numerous channels known as The Splits. There are no rapids in this section. From Kraus Hotsprings it is about 35 km to the park boundary. Another 30 km brings you to Nahanni Butte where the South Nahanni flows into the Liard River. The Liard, from Nahanni Butte to its confluence with the MacKenzie River at Fort Simpson, is navigable. Beaver Dam Rapids are rated Class III – Class II.